Einstein request to go take a shower in this video. He tells Jeff "see ya later and bye-bye," then waves. Clearly he wants to take a shower, or at least it appears so. Does Einstein like to take showers? I'd say he has a love/hate relationship with showers. In this video, he keeps saying "All done!" as if he is not enjoying it. However, he is flapping his wings and vocalizing one of his most popular sayings, "You're all wet!" In the next video, he fluffs up and really gets into the enjoyment of taking a shower. Many have asked, where we got the perch he uses. We made it out of PVC pipe. It's really handy and can be used in a low (as used here) and in a higher position. The sprayer is a lawn and garden sprayer that we purchased at a hardware store. We use it only for giving Einstein a shower, and we fill only with water. We never use herbicides or insecticides in it! Visit Einstein's Blog for more information about the perch, how it’s made, and the sprayer. Why do you shower a bird? A parrot in the wild gets the benefit of a rain shower. Therefore, we need to provide them with the same. Showers also keep the feathers in good contain as it promotes the need to preen. African Grey Parrots and some other parrots have a dander or feather dust that they naturally produce. Showering helps to keep the dander to a minimum in their environment as the confines of a house are much different from a forest. It's important to keep the feathers hydrated. To help with that, we also use a small hand held squirt bottle. In this bottle, we put a 50/50 mixture of water and Pure Aloe Vera Juice. (Use only 100% natural or pure aloe vera juice. Read the label and do not use aloe vera that contains any type of preservative. These chemicals are not good to spray on your parrot and could cause irritation.) The Aloe Vera juice is soothing and is a natural humectant. Never use soap on a parrot unless you absolutely need to and consult with an Avian Veterinarian for what kind of soap to use. Antibacterial soap is toxic to birds! Einstein gets a shower about once or twice a week. Using a shower perch is only one way to shower your parrot. There are many ways to bathe! Some parrots like a shallow dish of water, some will enjoy the direct spray from the shower head. Always shower your parrot when there is enough time to let your parrot dry completely before perching for the night. 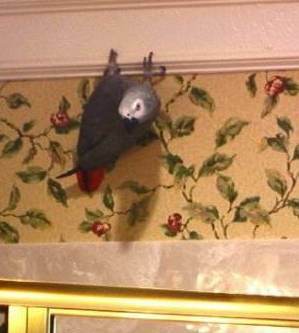 Let your parrot "air dry" away from drafts and in a warm environment. Never use a blow dryer. Some parrots are reluctant to bathe. If so, give it time to get used to the idea. Just run water near the bird. Offer a shallow dish and make small slashes with your fingers. Take it slow and don't force your parrot to do anything it doesn't want to do. It might take time, but eventually your parrot will learn to enjoy it! The shower is also one of Einstein's favorite places to hangout and play. We often take him in the bathroom with us as we shower and get dressed. He enjoys sliding down the shower door like a fireman's pole. He also learned how to climb the wall to get a drink of water. We have a perch in the shower just for him and we hang toys from it. Einstein enjoys the perch, but he learned a few other not so desirable activities. Einstein learned how to climb from the top of the shower wall and would crawl along the molding that surrounds the room. The glass light fixture was also within reach and very dangerous! 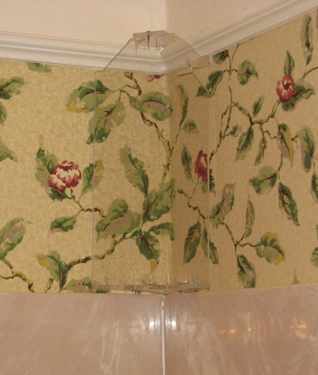 We had to design and install this plexiglas barrier in the corner of the shower to prevent him crawling up onto the molding. He would straddle each corner of the shower wall, then lift himself with his beak. Then, hold on with his feet. 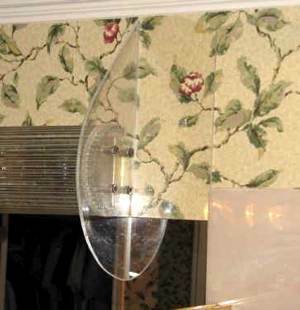 We made this plexiglas barrier near the light fixture to prevent him from further exploration and possible harm! As you can see in the previous videos and pictures, Einstein is quite the gymnast! In the video below he performs his Parrot Pull-ups! 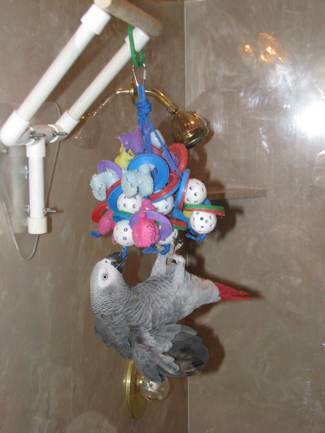 We provide toys for him on the shower to play with and he love to "hang around!" too! He isn't this active all of the time while on the shower. There are time when he's quiet and takes a nap too. After watching this video, you might think so! There have been studies done on the subject with Pigeons and Magpies. Both birds could pass the mirror test in the studies; however, it is argued that the birds were trained to look at themselves in the mirror and that a bird it the wild would not. I'm not a scientist; however, we have been giving our feather friends mirrors in their cages for a very long time. A mirror is a very popular bird toy! Do they think it's﻿ another bird? Maybe they know it's their reflection, as we do. Who knows! All I do know is that Einstein loves to play by the mirror. If we ever redecorate this bathroom, a specially placed mirror will be installed just for him! If I am playing video of him talking and he hears it, he will start repeating the dialog in the video. Is this not another form of self awareness? However, I cannot say he recognizes himself on a computer screen. This may be because parrots have an extra fourth cone in their eyes, as opposed to three in the human eye. This allows parrots to see ultraviolet light. They can see all the colors of the spectrum and then some that we can't see. Computer screens and TV screens may not look the same to them as they do to us. In the video below I hold Einstein in front of a mirror and asked, "Where's Einstein?" and he will tap the mirror with his beak, indicating he is Einstein. Then, I'll ask, "Where's Marcia?" and he will tap me on the nose. Not a scientific study, but interesting and fun! Einstein Helping in the Shower! Einstein is very helpful when we take a shower too! Here, he is offering to get the towel. Often, this involves him tossing the towel from the shower onto the floor. Not exactly helpful, but a good effort on his part. Einstein enjoys watching us while we get dressed in the bathroom. He often sits on top of the shower and preens his feathers, or talks. We are careful not to spray deodorant or hair care products if he is present. Products such as these are dangerous to a parrot respiratory system and could be fatal. Always err on the side of safety and never spray or use chemicals around a parrot! Einstein watches me as I do my makeup almost every day. The brush I gave him to play with is clean and has never had makeup on it. As he plays, you can see that he imitates the way I apply the makeup as he wiggles his body! He also will hold the brush by the handle with his beak. The handle is a metal, probably aluminum. If he deliberately started to chew the metal, I would take it away from him. Parrots should not have any zinc, lead or other metal items. Ingestion of these metals can cause serious illness and even death. Stainless steel is the only safe metal for a parrot. Because I'm not sure of the metal I only allow him to play with it under very close supervision. After all, it is not a "parrot toy."